San Antonio is well known as the sun and booze fuelled party capital of Ibiza, but do San Antonio holidays have a different side? Well sort of! In reality most party-seeking holidaymakers flock to the many and varied San Antonio hotels and base themselves in the town, as it’s the best place to get right in to the thick of the Ibiza action. But spending the nights (and days!) in the bars and party spots of the town consuming interesting cocktails is not the only thing the resort has to offer. San Antonio, is a well-established tourist haven and one of the most colorful holiday destinations in the Mediterranean. The green palm-lined boulevard, crystal blue harbour waters and glorious orange sunsets all contribute to a wonderfully vibrant atmosphere and make it a fantastic place to spend a week or two’s holiday. 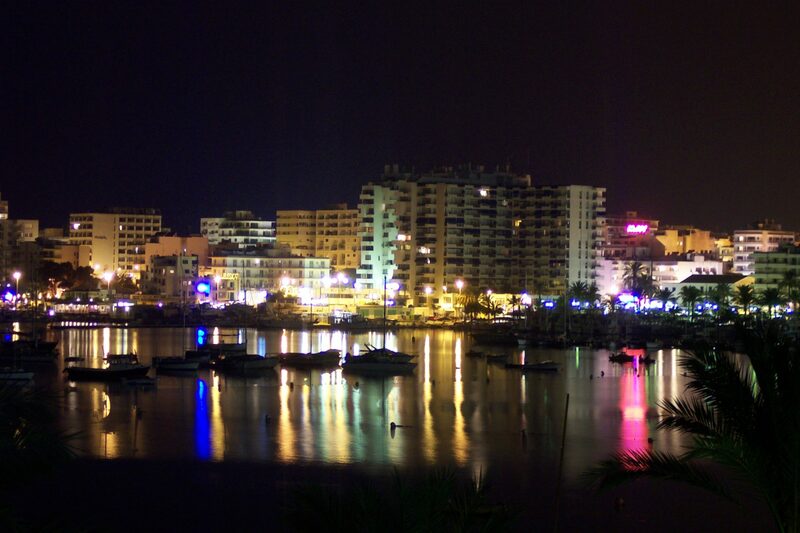 The town is split into three main areas, ‘Westend,’ ‘Sunset Strip’ (‘Ses Variades’ and ‘The Bay’ (‘Cala De Bou’). San Antonio’s Cala De Bou is one of the most famous natural harbours in Europe and has quite a heritage, having been first constructed by the Romans. What’s that f*cking Egg all about then?! San Antonio is incredibly well connected – it is only a short twenty minute car ride from Ibiza Town, and easily accessible by land or sea. The large marina in the town houses fishing boats and luxury liners alike, as San Antonio is welcoming to everyone, whether on the hunt for luxury or budget value for money. It is one of the liveliest resorts on the island, so families looking for tranquil spaces and kid friendly activities might find San Antonio a bit frenetic for their taste and may be better off heading for the nearby San Antonio Bay area. Of course one of the reasons holidaymakers flock in droves to Ibiza is for the fabulous beaches and the opportunity to soak up the sun. San Antonio town is well equipped to accommodate this with the New Beach, which is an expanse of shallow turquoise water with plenty of room to relax and take in the tropical temperatures. If you’ve had your fill of basking in the 300 plus days of sunshine Ibiza gets each year you can retire from the beach to any one of the wide selection of restaurants, offering everything from fresh seafood, to egg and chips. Read more about San Antonio Beach by visiting our Ibiza Beaches section. Hotel accommodation in San Antonio runs the gamut from luxurious to charmingly affordable and you’re unlikely to not be able to find a room, view and breakfast option within your budget. Whilst San Antonio is a great place to wile away the sunny days, it is at dusk that the town really turns on the charm. The sunsets that the town is so famous for are best viewed from Calo d’es Moro, better known as the ‘Sunset Strip,’ where there are a selection of bars and cafes, where fun seekers can take in the legendary view. Cafe del Mar is probably the most popular and offers great cocktails and chilled out beats to accompany your sunset experience, as well as some great memories to take back home (or post on social media). If you can’t find a free spot to perch on at Café Del Mar there’s also Mambo and other nearby bars that pull in the visitors with equally chic vibes. The West End is the area of town with the greatest concentration of bars and discos and is open for drinking and dancing through the early hours every night. You can get your groove on nightly at nearby clubs Es Paradis or Eden or alternatively hit the strip for cheap drinks then get a cab from San Antonio to Amnesia or Privilege.